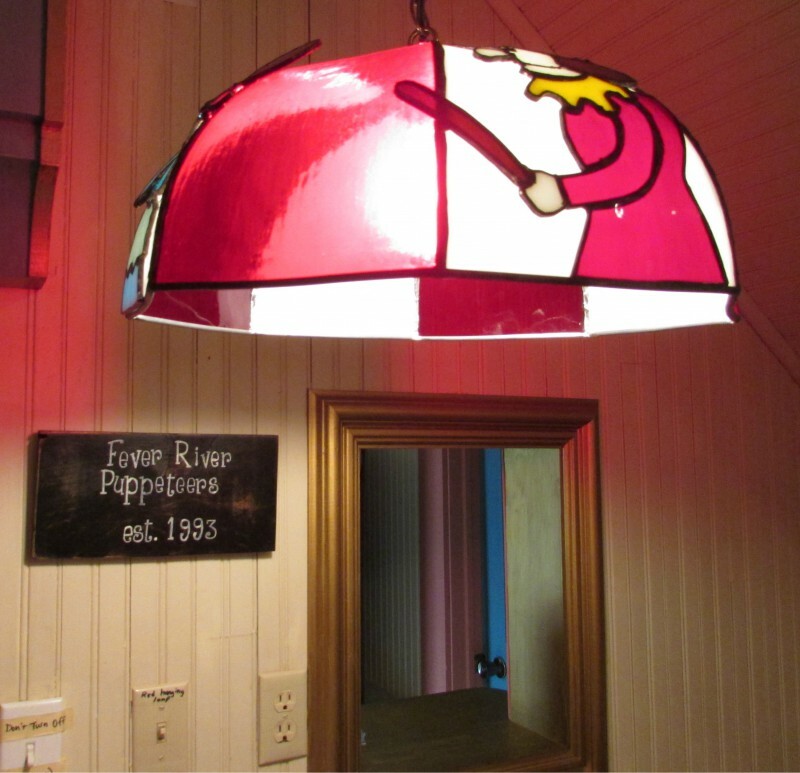 Hazel Green is home to the Fever River Puppeteers, owned by Chuck & Sandye Voight. 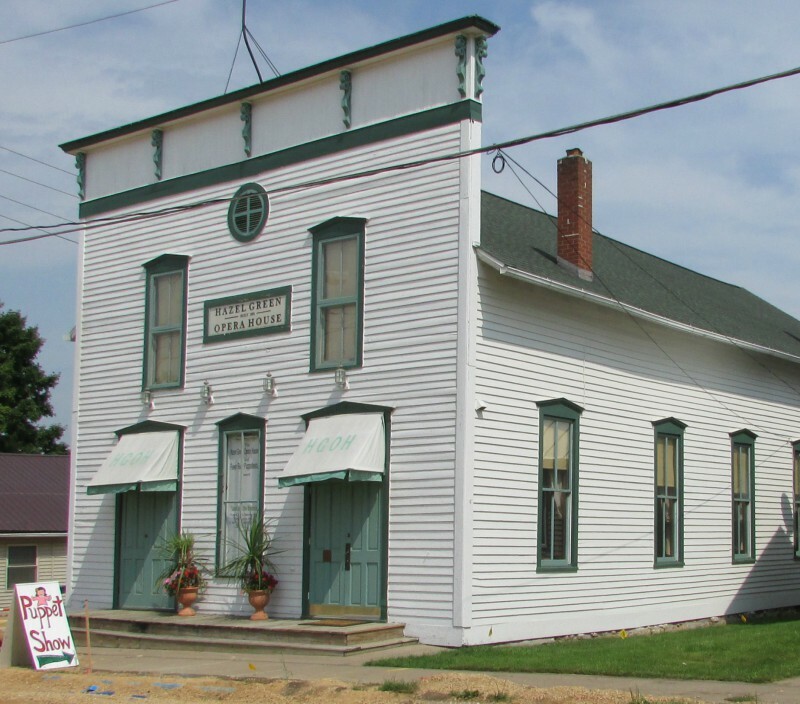 They started their company in 1993 in Benton, and started performing in the Hazel Green Opera House in 2004. 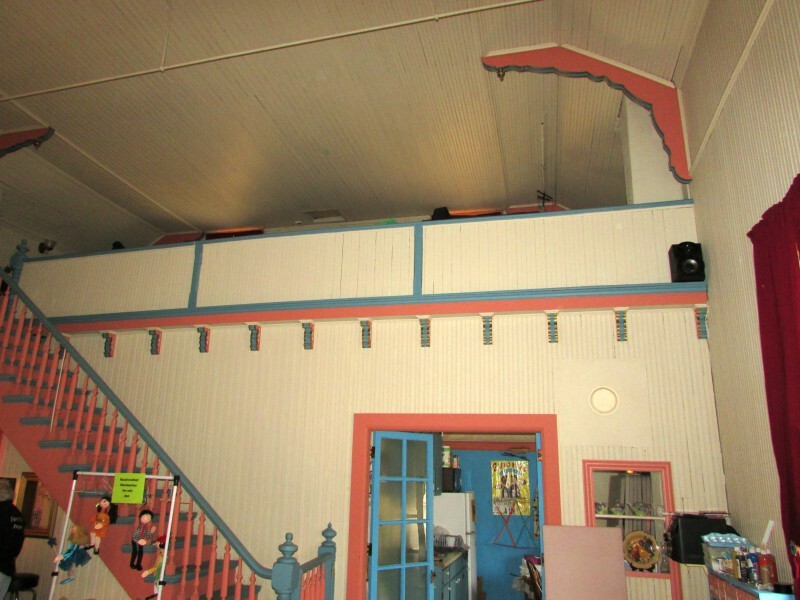 They have put a lot of work into the building to make it a fun and attractive place for their performances. Puppet were a large part of my childhood. 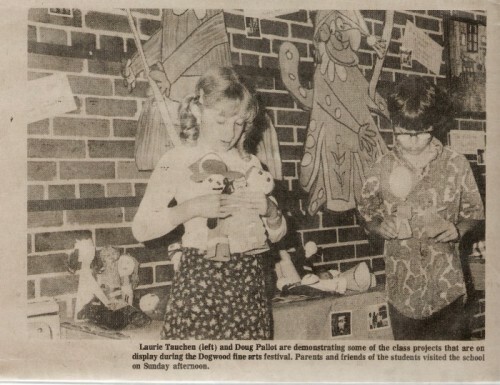 In 3rd grade I made a couple of hand puppets for a fine arts festival at my elementary school in 1975. 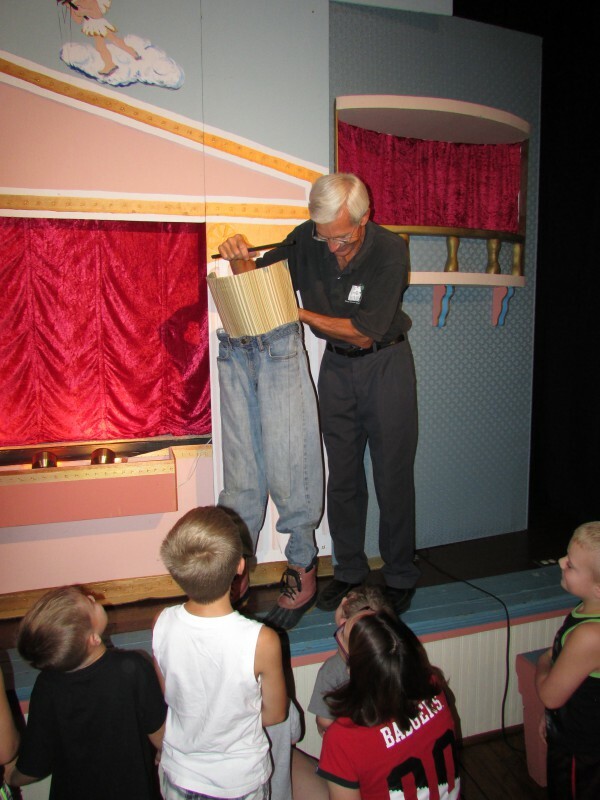 In 1977 I saw a performance by the now legendary Fred Cowan at Storybook Gardens in the Wisconsin Dells. He passed away in 2013, I was lucky to see him early in his career. My Grandfather recorded a bit of it. I was able to find the entire show that I saw! Doors open 1/2 hour before the performance, inside the lobby is an attractive ticket window. 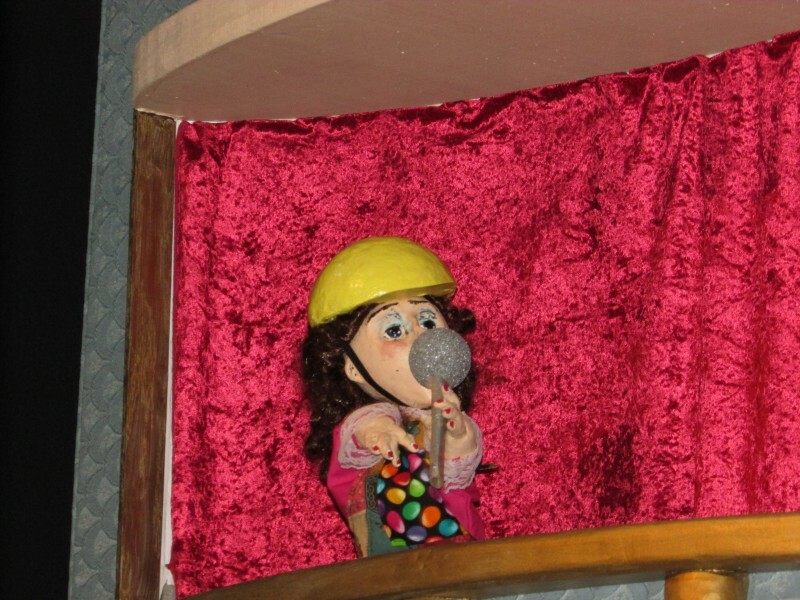 On display are puppets from another puppeteer. 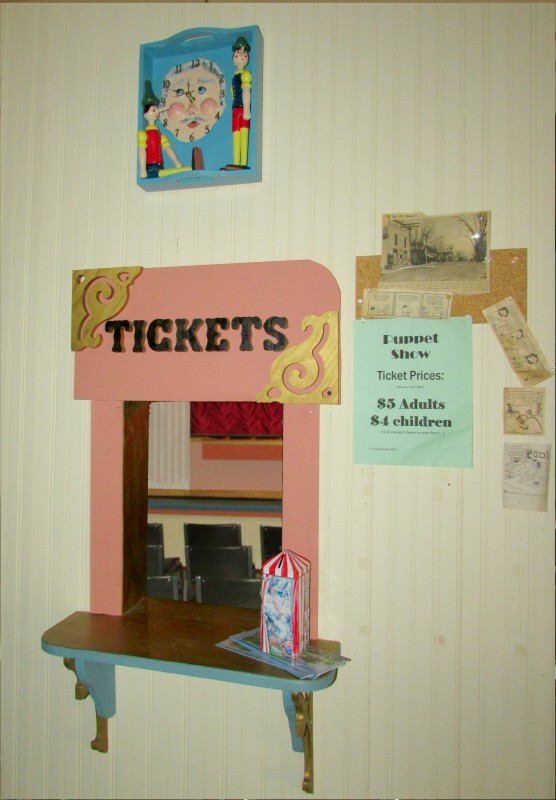 Other side of ticket window. Inside of the opera house, love the color accents! 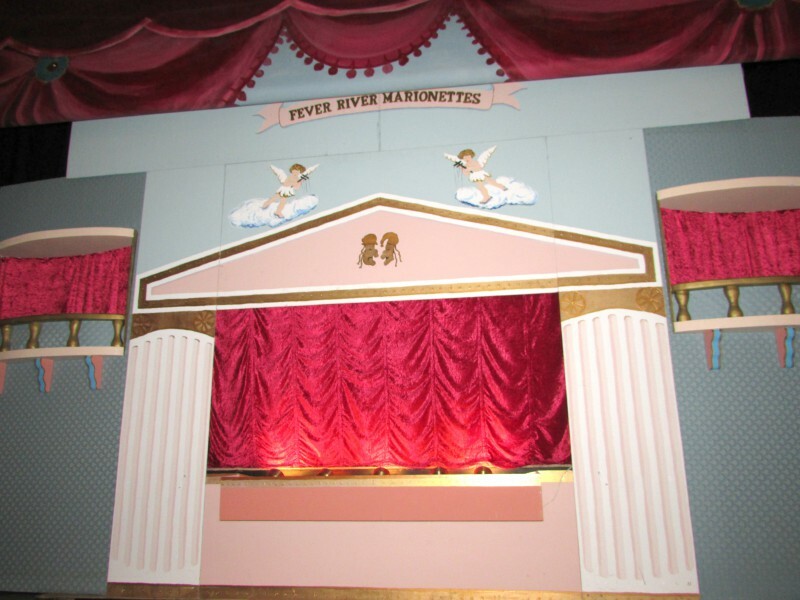 They also are selling some marionettes for $20 if you want to bring one home. 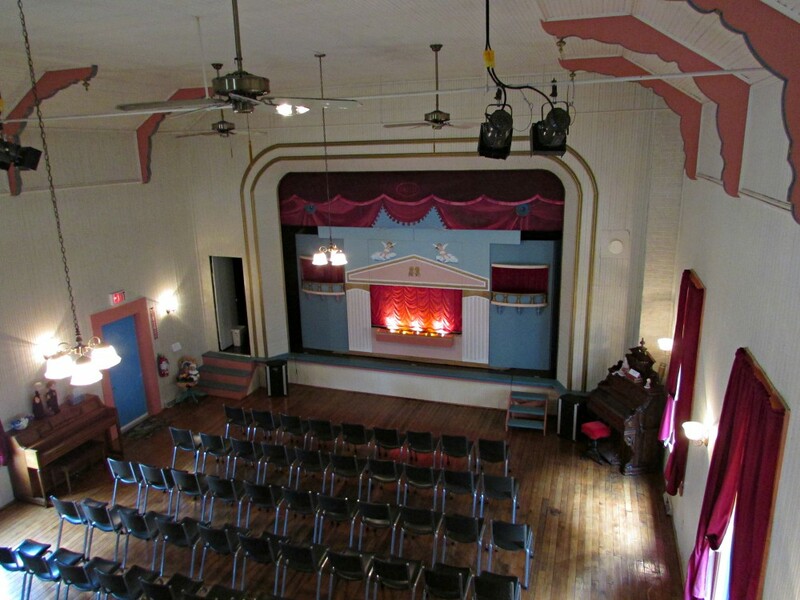 Chuck granted me special permission of the stage view from the loft, thanks ! 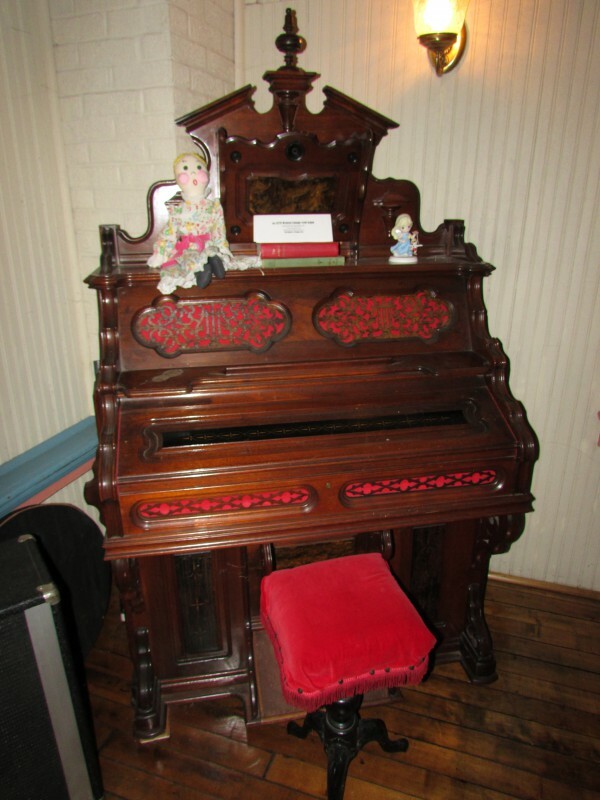 Some other puppets were on display and an antique reed organ. 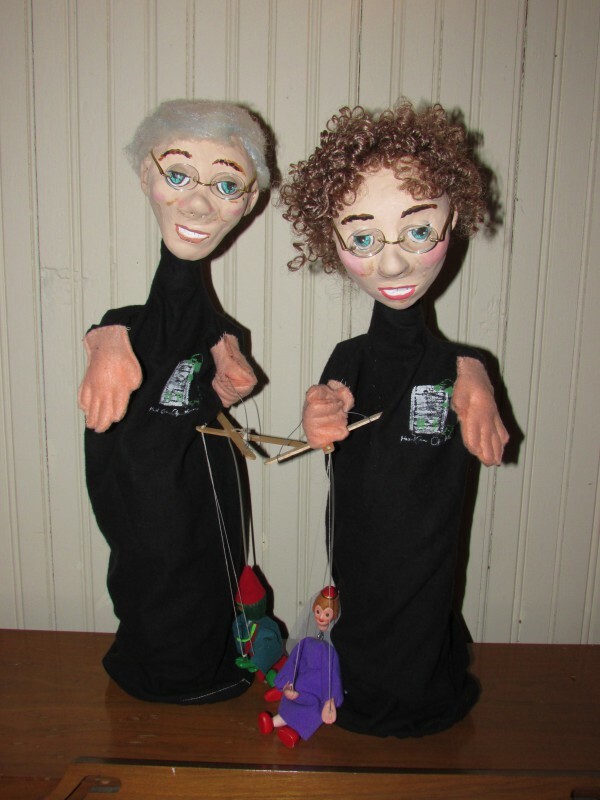 The funniest puppets were likenesses of Chuck and Sandye. You are whisked out of the complicated 21st century to a simpler time when a common form of entertainment is telling stories and making your own music. It was good seeing so many children at the 11:00 performance that we attended. It was now time for today’s show, Jack and the Beanstalk! 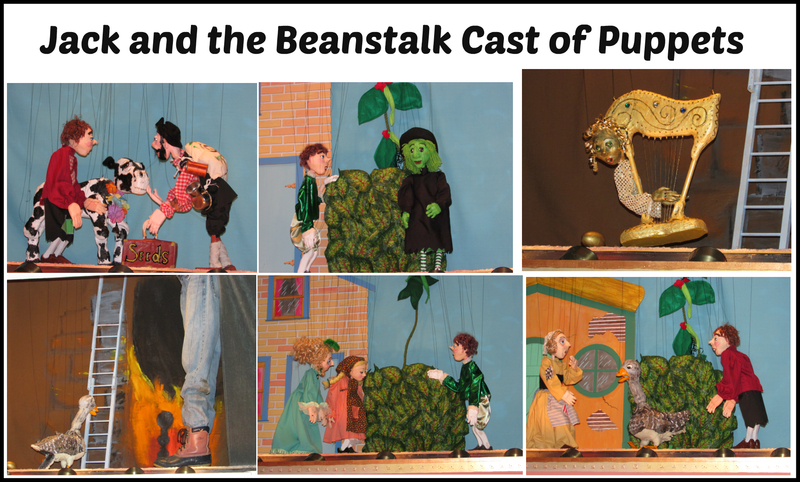 Here are a few scenes from today’s performance of Jack and the Beanstalk. Quite a large cast of characters in this show, Jack and his mom. Both rich and poor required separate puppets since the costumes are part of the puppet and can’t be changed. Also the cow, Jill, Puppet Lady in the beginning, salesman, Magic Harp, Witch Hazel Green, the Giant (who was virtually all legs!) and Gusilda the Goose. What a great performance, the show lasted one hour, from 11 to 12. 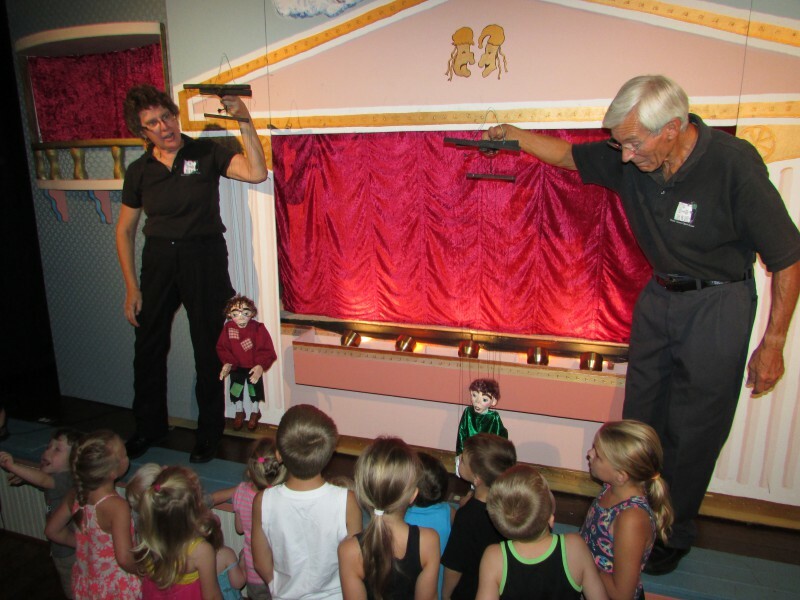 Afterwards Chuck and Sandye came out with the puppets to show the audience. The children gathered around happily. The “Giant” is hilarious! What a great show, well worth your time no matter your age. Read their blog for show updates and news.